It's easy to spot a really old photograph. Besides the antique cars in the background and the funny-looking clothes the people are wearing, the picture itself is likely to be yellowed or faded. But digitizing the photograph and using a processing software like Photoshop can restore the old photograph to close to its original condition. It also makes it easier to keep and store it. Many a Baby Boomer has begun combing through a lifetime of photographs, deciding which ones to keep and which ones to toss. And if photo prints are to be kept, they have to be physically stored somewhere, taking up room. That's why many people who happen to have hundreds, or even thousands of photographs have decided to reduce the number of prints in their collection and instead store their photographs digitally. If you decide to do that, however, it's a good idea to back up your collection. Hard drives have been known to crash. Ransomware could infect your computer, locking up all your files, including photos and videos. The easiest way to back up all your photographic records is to purchase a large thumb drive, copy files to it, and put it in a safe place. Cloud storage is another option. 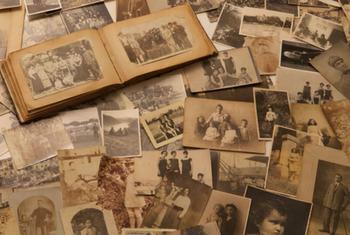 If you'd like to have your photos survive for 1,000 years, Yours.co has a service for you. It says it can offer "permanent" storage in the cloud. The service also automates backups from Instagram, Flickr, Google Photos, Dropbox, Facebook, and Google Drive. The company maintains that even a thumb drive back-up is temporary, lasting only about five years. External drives, it says, have to be replaced about as often. "The typical consumer has literally thousands of pictures or videos stored on various electronic storage devices and cloud services,” said Paul Brockbank, CEO of Yours.co. “And yet, most don't understand the limitations of these storage media that make data loss a real possibility. The pictures of your wedding, last year's vacation or that video of your child's first steps are irreplaceable. Losing any of them would be tragic. Yet people lose photos and videos all the time – and don't know it." The new service costs $8 a month or $89 a year. The cost includes sending discs containing the files to your home, or to a vault. The vault, the company says, is carved into the side of a mountain and can withstand a nuclear attack.